The teaching materials for the learning experience on “The Restoration” are divided into three parts. In part 1, students will study paragraphs 4.1 through 4.11 of this doctrinal topic using the information in the Doctrinal Mastery Core Document. They will learn about Joseph Smith’s First Vision, his calling as the Prophet of the Restoration, and his translation of the Book of Mormon by the gift and power of God. They will also study the doctrinal mastery passages Joseph Smith—History 1:15–20 and Doctrine and Covenants 135:3. Why was there a need for a restoration? What is a dispensation, and how does it relate to restoration? 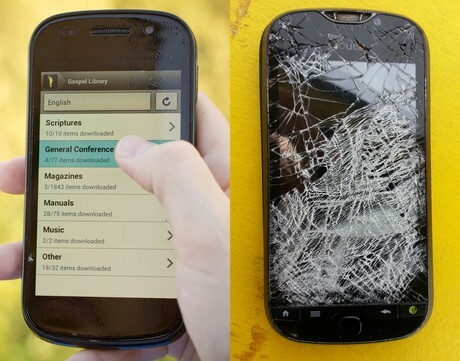 Begin by showing students something that was once new and pristine but has been damaged and is now useless. What would need to be done to restore this item to its original condition? Ask students to turn to doctrinal topic 4, “The Restoration,” in the Doctrinal Mastery Core Document. Invite students to read paragraphs 4.1 through 4.4 with a partner, looking for which questions on the board can be answered from the information in these paragraphs. After sufficient time, invite several students to report which questions can be answered. Ask them to answer the questions using their own words. Repeat this process for paragraphs 4.5 through 4.7, and then for paragraphs 4.8 through 4.11. You could ask students to work with different partners each time they read and look for answers to the questions on the board. Display the picture The First Vision ( Gospel Art Book , no. 90; also available on lds.org/media-library). Invite students to search paragraph 4.2 in the Doctrinal Mastery Core Document for the key statement of doctrine that describes this picture. (Help students find the following statement: God the Father and His Son, Jesus Christ, appeared to Joseph Smith in response to Joseph’s prayer, and They called him to be the Prophet of the Restoration. Invite students to mark this statement in their copies of the Doctrinal Mastery Core Document ). Explain that Joseph Smith—History is an extract from a much larger history written by the Prophet Joseph Smith in 1838. Joseph Smith—History covers some of the early events in Joseph’s life through May 1829. Invite several students to take turns reading aloud from Joseph Smith—History 1:15–20. Ask the class to follow along, looking for details in Joseph Smith’s experience that led to his First Vision. Invite students to consider marking what they find and to report to the class. To help students feel the truth and importance of the key statement of doctrine they marked in paragraph 4.2 in the Doctrinal Mastery Core Document, invite a student to read aloud the following statement by Elder Dieter F. Uchtdorf of the Quorum of the Twelve Apostles. Explain that when he was a young boy, Elder Uchtdorf attended church meetings in Zwickau, Germany. His responsibilities sometimes included pumping air through the bellows of the organ to allow the organist to play the congregational hymns. Elder Uchtdorf explained that the seat of the bellows operator offered a great view of a beautiful stained-glass window portraying the First Vision. Invite students to listen for how this experience influenced Elder Uchtdorf’s testimony of the Prophet Joseph Smith. “I felt a special spirit while looking at the beautiful scene in this window picture of a believing young boy in a sacred grove who made a courageous decision to earnestly pray to our Heavenly Father, who listened and responded lovingly to him. “Here I was, a young boy in post–World War II Germany, living in a city in ruins, thousands of miles away from Palmyra in North America and more than a hundred years after the event actually took place. By the universal power of the Holy Ghost, I felt in my heart and in my mind that it was true, that Joseph Smith saw God and Jesus Christ and heard Their voices. The Spirit of God comforted my soul at this young age with an assurance of the reality of this sacred moment. … I believed Joseph Smith’s testimony of that glorious experience in the Sacred Grove then, and I know it now” (Dieter F. Uchtdorf, “The Fruits of the First Vision,” Ensign or Liahona, May 2005, 37). How did this experience influence Elder Uchtdorf’s testimony of Joseph Smith? In addition to pondering the events of the beginning of the Restoration, what else can we do to invite the Holy Ghost to testify of the truth that Joseph Smith was a prophet? To help answer this question, invite a student to read aloud the following statement by Elder Neil L. Andersen of the Quorum of the Twelve Apostles. “A testimony of the Prophet Joseph Smith can come differently to each of us. It may come as you kneel in prayer, asking God to confirm that he was a true prophet. It may come as you read the Prophet’s account of the First Vision. A testimony may distill upon your soul as you read the Book of Mormon again and again. It may come as you bear your own testimony of the Prophet or as you stand in the temple and realize that through Joseph Smith the holy sealing power was restored to the earth. With faith and real intent, your testimony of the Prophet Joseph Smith will strengthen” (Neil L. Andersen, “Joseph Smith,” Ensign or Liahona, Nov. 2014, 30). How have you come to know that Joseph Smith was called of God to be the Prophet of the Restoration? Invite students to think about what they know about the life of the Prophet Joseph Smith. Ask a student to read aloud paragraph 4.3 in the Doctrinal Mastery Core Document. Invite the class to follow along, looking for something that Joseph Smith was able to accomplish as the Prophet of the Restoration. To help students understand the context of this passage, explain that Doctrine and Covenants 135 is the announcement of the martyrdom of Joseph and Hyrum Smith. President John Taylor, who was with Joseph and Hyrum in the jail at Carthage, Illinois, when they were killed, expressed his witness of the role Joseph Smith played in the Restoration as a chosen servant of the Lord. Invite a student to read Doctrine and Covenants 135:3 aloud. Ask the class to follow along, looking for how this passage helps teach the key statement of doctrine in paragraph 4.3. Ask students to report what they find. Invite students to ponder their feelings about Joseph Smith and what he accomplished as God’s prophet during his short lifetime. Invite a few students to share their feelings with the class. Consider sharing your own testimony of the Prophet Joseph Smith. “To the youth … I give a specific challenge: Gain a personal witness of the Prophet Joseph Smith. … Here are two ideas: First, find scriptures in the Book of Mormon that you feel and know are absolutely true. Then share them with family and friends in family home evening, seminary, and your Young Men and Young Women classes, acknowledging that Joseph was an instrument in God’s hands. Next, read the testimony of the Prophet Joseph Smith in the Pearl of Great Price. … This is Joseph’s own testimony of what actually occurred. Read it often. Consider recording the testimony of Joseph Smith in your own voice, listening to it regularly, and sharing it with friends. Listening to the Prophet’s testimony in your own voice will help bring the witness you seek” (Neil L. Andersen, “Joseph Smith,” Ensign or Liahona, Nov. 2014, 30). Encourage students to choose one of the ideas from Elder Andersen or to think of a similar challenge of their own. Note: The following review activities are not intended to be taught during the same class session as this lesson—“The Restoration, Part 1.” Please present these activities during seminary class sessions that take place after you have taught this lesson, but before you teach “The Restoration, Part 2.” These short reviews can be taught at the beginning or end of classes in which you teach a regular sequential scripture lesson from the Doctrine and Covenants. Be sure that these reviews take no longer than five minutes each, so as not to take away from the scripture block students will be studying in class. To whom did they appear? What did they do after they appeared? Where in the scriptures is this account found? Invite a few students to read their sentence aloud to the class. 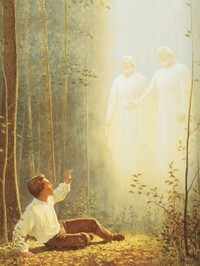 Then ask students to turn to paragraph 4.2 in the Doctrinal Mastery Core Document and locate the key statement of doctrine associated with Joseph Smith—History 1:15–20 (God the Father and His Son, Jesus Christ, appeared to Joseph Smith in response to Joseph’s prayer, and They called him to be the Prophet of the Restoration). Invite students to repeat this key statement of doctrine in their minds several times until they can comfortably repeat it to someone else. Invite the student with the list of words and phrases to provide clues to help his or her partner guess each of the words and phrases on the list. When the students have completed the list, invite them to locate the key statement of doctrine in paragraph 4.3 in the Doctrinal Mastery Core Document, which reads as follows: As the Prophet of the Restoration, Joseph Smith translated the Book of Mormon by the gift and power of God. When all of the groups have found the statement, ask students to find the doctrinal mastery passage in the Doctrine and Covenants that helps teach this doctrine. After students have located Doctrine and Covenants 135:3, invite a student to read it aloud to the class. Ask the class to follow along, looking for the words and phrases from the list that they were given (the word Restoration should be the only one not found in Doctrine and Covenants 135:3). Days of Harmony (25:00)—Witness Oliver Cowdery’s experience as Joseph Smith’s scribe during the translation of the Book of Mormon. Consider showing this video from timecodes 6:00 to 10:31 to help students understand and feel the truth and importance of the following doctrinal statement: As the Prophet of the Restoration, Joseph Smith translated the Book of Mormon by the gift and power of God.